This morning we were treated with something that has been lacking in our voyage down the Kuril Islands - warm weather! From the Odyssey we could see the town of Kurilsk where we would soon be landing. It was the first sign of any sort of civilization since we cruised by Paramushir Island, at the top of the Kuril Island chain. As we took the zodiacs to shore we passed through a series of nets laid out in front of the river where the pink salmon were head upstream. Our landing on the bank of the river was the driest of all the "wet" zodiac landings that we had made on our expedition and no one had to worry about getting their feet wet. On landing we were greeted by an accordion player playing a medley of Russian folk tunes, and a young man and woman dressed in traditional Russian costumes who gave us the traditional Russian welcome for travelers - bread and salt. After landing, we noticed heavy activity up river, about 200 feet from our landing. Fishermen had strung a long net completely across the river. All the salmon that were headed up river to spawn were blocked by the net. The fishermen had then strung out another net, just downriver from the main net, which trapped the salmon between the two. With a small row boat the fisherman took another net and herded the fish to our side of the river where they were hoisting the salmon out of the river, using a unique contraption that was not sophisticated, but showed their industriousness with limited resources. A metal platform, about 20 feet high had been constructed on river bank. A metal slide reached from the top of the platform to the river. A scooping net was connected to a pulley suspended from a metal arch above the platform. The long rope from the net was connected to a bulldozer next to the platform. The bulldozer moved forward lowering the scoop net into the river, where it was filled with salmon. The bulldozer pulled back and the net slid up the slide to the top of the platform. 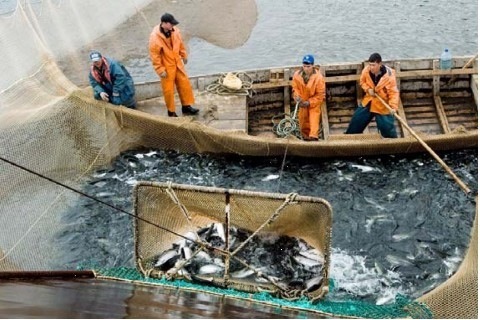 Men on the top of the platform pushed the net over the edge of the platform and opened the bottom of the net and the flapping fish were thus released into a dump truck parked beneath. After watching repeated iterations of this fishing process we proceeded to the tallest building in town, the elementary school/museum. In front of building the local Russian Army band played a selection of Russian songs for our enjoyment and a Russian couple in traditional dress were standing at a table offering us bread covered with red caviar (salmon eggs) and shots of vodka. When the band finished playing we were escorted into the school building and led to the second floor where the local museum was located. In one room was a selection of scenic photography by a local photographer. The actual museum was a tiny room with artifacts in glass cases and a few stuffed animals. The museum's curator told us about the collection with the help of a local translator. The artifacts showed the history of Iturup Island, from the ancient Ainu, to the Japanese, and to now the Russians. After leaving the museum we were led along the gravel and dirt streets past a large bust of Lenin, to the Russian Orthodox church where the Sunday services were being held. The tiny church would only accommodate a few of us at a time, so we had to cycle through the church so we all had a chance to observe the service and see the various elaborate religious icons that adorned the walls. Following our visit to the church we had time to explore the town on our own, or join a guide for a tour of the town, which included a ride on a local bus and visits to markets, a new school, and the chance to see the exteriors of the homes and apartments. It was a grimy, dirty little town, but in front of many of the small, single story homes were nice gardens that brightened the drab exteriors of the homes, at least somewhat. When we returned to board our zodiacs we found that it was probably an especially warm day, because the local cows had come down to the beach to sunbathe! Back onboard Odyssey, after lunch, John gave a lecture about history of Kuril Island, relating their first discovery, the Ainu inhabitants, and then, the changes of ownership between the Japanese and Russians, until today with the ongoing dispute between Japan and Russia over ownership of the Southern Kuril Islands, known to the Japanese as the Northern Territories. Later in the afternoon, Brent, gave a lecture about his role in the rediscovery of the formerly "extinct" New Zealand Storm-Petrel. Later that evening, we dropped off our Russian agents, Nadia and Dennis, cleared Russian customs and immigration and steamed south, leaving Russian waters, heading toward our next port of call - Kushiro, Japan!